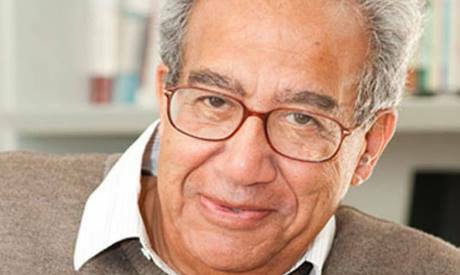 Egyptian writer and economist Galal Amin died Tuesday 25 September at the age of 83 after a battle with illness, his family announced. Galal, who was born in 1935, was best known for his books Whatever Happened to the Egyptians? (2000), Whatever Else Happened to the Egyptians? (2003), Egypt in the Era of Hosni Mubarak (2011), and The Illusion of Progress in the Arab World (2006). Galal Amin was the son of Egyptian jurist and academic Ahmed Amin, who was an academic rival of one of Egypt's most famous writers of all time, Tahah Hussein. Amin graduated from Cairo University in 1955 with a law degree, before traveling to Britain to continue his studies at the London School of Economics. He returned to Egypt in the mid 1960s to teach at Ain Shams University, and later American University in Cairo. Amin was a vehement critic of the former President of Egypt Hosni Mubarak, and was regarded as a prominent opposition figure during his rule, particularly in the final ten years. In 2012, he published his book "Whatever Happened to the Egyptian Revolution? ", which tracked corruption in the Egyptian economy during the rule of ousted President Hosni Mubarak, analysing the reasons behind Egypt's economic collapse, which gravely affected the poor and middle class and paved the way to revolution. In a public event in 2012 at Cairo international Book Fair, Amin told the audience: "Poverty in Egypt changed its form under Mubarak," explaining that before 1952, "the poor lived in terrible conditions, many without shoes, but at least had a sense of contentment because they believed nothing could be done and everything was decided by fate. Under Mubarak, the poor are better dressed but suffer a deep sense of humiliation and see that their ambitions for a better life are not being met, despite better education. Thanks to television, everyone understands their deficiency and feels more excluded." Amin was a strong supporter of the 25 January revolution, and believed that the revolution's main achievement was to reinvigorate people's involvement in politics and public affairs.